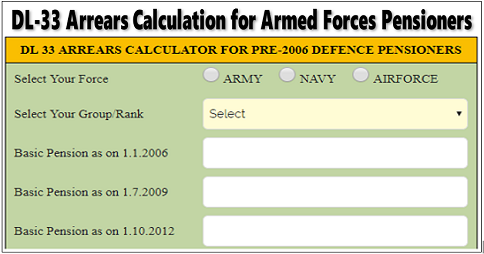 The Pension/ Family Pension of the Armed Force Personnel has been revised w.e.f. 01.01.2006, 01.07.2009, 24.09.2012 & 01.07.2014 (OROP). Hony. Rank of Naik, Havildar and Havildar holding Hony rank of Nb Sub are drawing pay in the pay scale of Sepoy, Naik and Havildar respectively. Select Your Group/Rank SelectX GP SepoyX GP NaikX GP HavildarX GP Naib SubX GP SubedarX GP Subedar MajorY GP SepoyY GP NaikY GP HavildarY GP Naib SubY GP SubedarY GP Subedar MajorZ GP SepoyZ GP NaikZ GP HavildarZ GP Naib SubZ GP SubedarZ GP Subedar MajorHony LtHony Capt SelectX GP Artificer VX GP Artificer IVX GP Artificer III-IX GP Chief ArtificersX GP MCPO IIX GP MCPO IY GP Seaman IIY GP Seaman IY GP Leading SeamanY GP Petty OfficerY GP CPOY GP MCPO IIY GP MCPO IZ GP Seaman IIZ GP Seaman IZ GP Leading SeamanZ GP Petty OfficerZ GP CPOZ GP MCPO IIZ GP MCPO IHony Sub LtHony Lt SelectX GP ACX GP LACX GP CPLX GP SGTX GP SGT(DIP)X GP JWOX GP WOX GP MWOY GP ACY GP LACY GP CPLY GP SGTY GP JWOY GP WOY GP MWOZ GP ACZ GP LACZ GP CPLZ GP SGTZ GP JWOZ GP WOZ GP MWOHony Fly OfficerHony Flt Lt. I Fulu Rani Roy family pensioner, my husband served in Army EME as Naik & DSC as Sepoy.Total service 30years +. retired on 1984. I have not received any arrears of D Linking 33 , Am I eligible to get any arrears if so what should be my total arrears, I am in receipt of ordinary family pension. Bijendra Dubey. Pcda pension circular No 568 payment of arrears as per delinking 33 yrs service has not been made till now .As per your calculation of arrears Rank of Subedar y gp 246497to be paid from 1-7-2009 to 30-06-2014 as per above circular. Sunil Rakshit Ex Naik retd on 01 March 2005 what amount will I get as arrear from revised pension to change fitment factor . 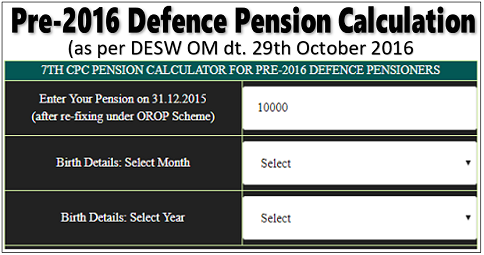 Yes,w.e.f 1/1/2016 Pension was revised, contact your ex-employer. Balwan Singh Chauhan, Ex-Petty Officer(Indian Navy), Service No. 163370-Y, retired on 31 January 2001 after completion of 15 years of service. sir how to get online eppo from pcdapension.nic.in my ppo particulars not available in pcda site. Very very bad! what about post 1016 pensioner? when they will be comes under 7 CPC is it after declaration on next CPC i.e 8 CPC? please comfirm. My husband retired from army armard core on 31st Aug 1996.his basic pen after prop is6665 and after revision 17129,what his total arrears? Naik get 15 years service to 24 years get same pension.This negligency started from last orop. In vew of the above mensioned I requist you to take nedfull action.